When it comes to the metalcore genre, one only has to stop still for a second and just look around at all the sea of bands trying to sound like anybody that starts gaining popularity, or just one another. Since their release of "Apologies For The Weak" in 2009, Miss May I have taken the US national metalcore scene by storm, and even eventually crossed the Atlantic to Europe to a great reception (which yours truly here managed to catch a show of). Anybody who has been around for a while longer than the kids today will know though that what Miss May I do isn't exactly new, with bands like Darkest Hour and As I Lay Dying having long perfected the art of thrashy melodic death metal riffs, and in the latter's case - metalcore tendencies like breakdowns and clean choruses. 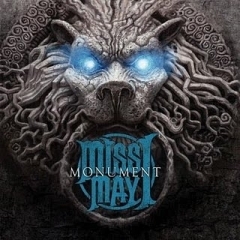 Nearly one year after their debut, Miss May I have quickly brought out their second record in "Monument". "Monument" sounds mostly like "Apologies For The Weak" in that is essentially still the same kind of metalcore - harmonised melodic death metal guitar riffs, blazing machine gun drumming, screamed verses and the odd sung choruses, and ofcourse breakdowns. What has changed though is the band's attitude to their guitar work in particular. 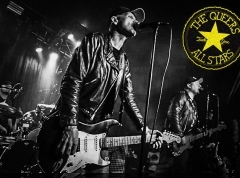 Everything has gotten, cleaner, and generally more melodic. Whereas in "Apologies..." there was a sort of in-your-face thrashy approach that reminisced heavily of early Darkest Hour, with "Monument" everything has shifted to be more melodic and calculated like As I Lay Dying. And when I say that, I mean almost "exactly" like As Lay Dying. It wouldn't be such a problem had the songs on this album all not repeatedly used the same kind of melodic guitar riffing, and suffering a consequence of riffs all too often (albeit remaining impressively) sounding almost identical in their construction either - even with chord changes. Early standouts such as "Masses Of A Dying Breed" and "Relentless Chaos" are well written and very enjoyable metalcore songs, but they reek of As I Lay Dying worship so bad (the intro of the former most notably, and with the latter, just listen to 'As I Lay Dying - Parallels' to see the uncanny resemblances). Making further direct comparisons to "Apologies..." anyhow, the general level of technicality and instrument competence has at least improved which in turn has also pushed the number of breakdowns down a little, though I was expecting the breakdowns to be harder and heavier. One thing that made a lot of those breakdowns tolerable for me on "Apologies..." in the first place was just how much attitude was imbued through their heaviness and rhythm, as in they were cool sounding and fun in a non-serious sense. Here a lot of the time they are sort of just, there because they're expected to be which is a bit of a shame ("Collossal" and "We Have Fallen" perhaps most resemble the old album however with some unforgiving breakdowns). Also the guitar solos have kind of gone missing save for one song (at least on the standard album release), not that they were all that much to write home about in the first place. The one exception however is if you managed to pre-order the album through itunes, you acquired a bonus track in "Rust" which featured Brandan Schieppati of Bleeding Through and comes at the end of the album. That song seriously tears it up hard with viscerally heavy guitar work and a soaring solo lead guitar, and I was surprised it wasn't part of the regular album. Though through the lyrical matter and the samples used, it sounds like a song dedicated to Call Of Duty: Modern Warfare - a US national pastime it seems. One final note to mention is that since the release of "Apologies..." the band has changed their full time bassist and clean vocalist to Ryan Neff. He actually sounds like Josh Gillispie (their previous recording bassist and clean singer) in both tone and style. However the choruses he sings often tend to all sound too similar, nor do they have great melodies so they actually sound pretty dull. He likes to hold notes for annoyingly long periods and so the singing doesn't sound natural nor extremely well trained - and this becomes glaringly obvious in the cringey non-screaming ballad "In Recognition" which is just a plain bad track (and one suspects some heavy auto-tune patching), a song that I always end up skipping straight for the final song "Monument" which is not so much a song that is worthy of any additional mention - it's just pretty standard and doesn't really end the album particularly memorably, unless you have "Rust" in which it's a different story. So all in all, "Monument" doesn't really live up to its name in one regard and one thinks perhaps the space of a year was not enough time for them to get enough new ideas on the board. It may be a more polished, a more shiny, and a technically superior album, but it's full of cliches, it's definitely been heard more or less before in other albums even this year and suffice to say, it's probably just for the hard fans only.